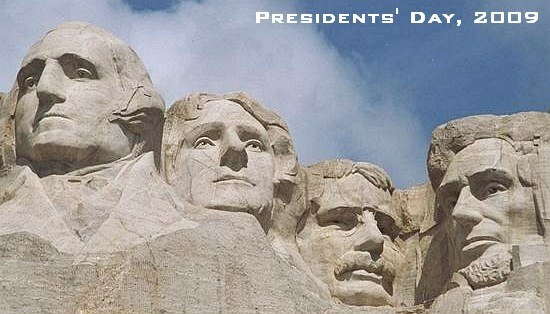 Today we celebrate Presidents’ Day. It is worth remembering that many of America’s greatest Presidents were avid rifle shooters, including all four whose faces are enshrined in stone at Mt. Rushmore. Washington, Jefferson, Lincoln, and Theodore Roosevelt were all shooters, and in today’s world they would probably be called “gun nuts” by the mainstream press. Abraham Lincoln learned to shoot as a boy and used a rifle to put food on the family table as he grew up on backcountry farms in Kentucky and Indiana (Lincoln was 21 when his family moved to Illinois.) Even as President, Abe Lincoln remained very interested in firearms and he was a good marksman. When, during the Civil War, he was approached by Christopher Spencer, inventor of the Spencer Rifle, Lincoln tested the gun himself on the grounds of the White House. According to Mr. Spencer’s journal: “On the 18 of August, 1863, I arrived at the White House with rifle in hand, and was immediately ushered into the executive room. I found the President alone. With brief introduction I took the rifle from its case and presented it to him. Looking it over carefully and handling it as one familiar with firearms, he requested me to take it apart to show the ‘inwardness of the thing’. After a careful examination and his emphatic approval, I was asked if I had any engagement for the following day. When I replied that I was at his command, he requested that I ‘Come over tomorrow at 2 o’clock, and we will go out and see the thing shoot’.” The next day Lincoln and Spencer tested the rifle on the White House lawn. Lincoln shot the rifle very well and recommended that it be adopted by the military. 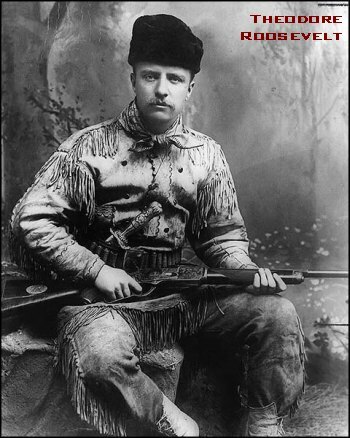 Theodore Roosevelt was an avid hunter and conservationist. 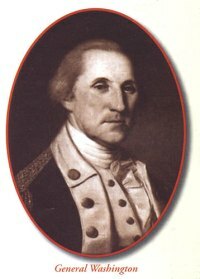 As a young man, he had his own ranch in the Dakota Territories where he enjoyed hunting buffalo, elk and other big game. Roosevelt earned fame an a “Rough-Rider” in the Spanish-American War. When he left the White House in 1908, he embarked on a lengthy African safari with his son Kermit. Roosevelt recounted his safari experiences in his book, African Game Trails, considered one of the “classics” of outdoor adventure literature. So there you have it… four of America’s finest Presidents were avid gun enthusiasts. They lived in times when shooting a rifle was considered both a manly pursuit and an essential survival skill. Today, in the 21st century, the mass media often depicts gun owners as extremists. Today’s journalists would be wise to re-learn their American history and acknowledge that many of our nation’s greatest leaders were riflemen. Share the post "Presidents' Day — And a History Lesson"
We recently tested two large spotting scopes and two high-magnification riflescopes to see if they could resolve 6mm bullet holes at 600 yards. In ideal, early-morning conditions, we could see 6mm bullet holes in the white with all four optics (Pentax PF100ED, Swarovski 80mm ATS, March 10-60, Nightforce 12-42 BR). However, as the day wore on, and mirage increased, it became increasingly difficult to see the bullet holes, even with the big spotters. It became obvious to our crew of testers, that if you want to see 6mm bullet holes at 600 yards and beyond, in all conditions and against any background color, some kind of remote camera system may be easier on the eyes than even the finest high-power glass you can buy. 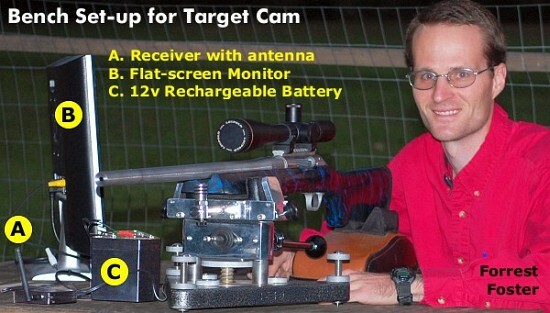 By placing a remote camera relatively close to the target, you bypass many issues that compromise optical resolution. You can see the target clearly even in misty conditions or when the mirage is extreme. You can view your target easily on a large screen… that means no more straining with tiny (1mm) exit pupils with ultra-critical eye relief (move your head slightly and you lose the “view” completely). Over an extended period, you’ll experience much less eye fatique using the target cam. You can put together a good long-range target cam system for under $1200.00. This will include camera, tripod, remote wireless transmitter, receiver and monitor/display screen. You can shop for your own components through catalogs. Or you can contact Forrest Foster, an AccurateShooter.com Forum member and long-range shooter from South Dakota. Over the last couple of years, Forrest has experimented with a variety of Target Cam components. He’s field-tested different cameras and transmitter/receiver packages and come up with an affordable system that works reliably at 1000 yards and beyond. Foster offers his target-cam set up in two configurations. For $825.00 he supplies a quality Sony video cam, wireless transmitter and receiver, cables and powerful, rechargeable 12 volt batteries. All you need to do is add a monitor or small TV set. If you already have a video camera, Forrest offers the same package, without the Sony camera, for $525.00. For more information, call Foster at (605) 342-8320, or email FFoster [at] dsginc.biz. Forum member Donovan has used Foster’s target cam system extensively, and currently has it deployed using an older camcorder rather than the Sony device. Shown below is Donovan’s screen displaying a target placed 1000-yards away. Note you can see the bullet holes clearly. Donovan is highly pleased with the set-up and says it works great all the way out to 1000 yards. Donovan writes: “For those interested, I am one of Forrest’s system testers. 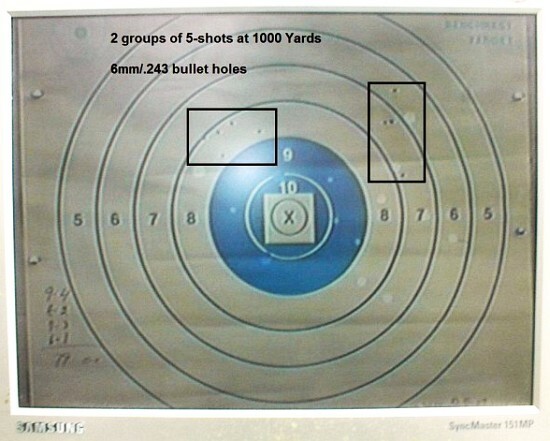 With a cheap Sanyo 21″ TV, I get a great picture of the target at 1000 yards. With a Samsung 151MP flat screen, I get a better target view yet. The video camera that Forrest sells with the system features a variable focal 5-50x lens. In testing, I have placed it as close as 5 feet and as far as 75 feet (25 yards) away from the target with no difference in quality of view on the screen. Just simply adjust the zoom to the amount of target you want displayed. Share the post "Target Cam System for Long-Range Shooting"